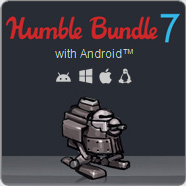 Check out the latest Humble Bundle featuring an amazing selection of games for Android, iOs, Pc, Mac, and Linux! The bundle contains Greed Corp, Worms Reloaded, The Bard’s Tale, Ticket to Ride, Incredipede, and Anodyne. (Bundle has ended). Pay what you want. Support charity. Get awesome cross-platform games! Clik here for the bundle, or use the fancy widget below.